The fine tuned palates of over 5000 reviewing contributors for Opinionated About Dining Top 100+ European Restaurants 2018 say Le Calandre deserves to be ranked at No.10. The Oscars of the restaurant world, The Worlds 50 Best Restaurants list for 2018 has placed Le Calandre at No.23, they’ve said that Le Calandre is; “something very special”. We leave our base in Paris today for our special journey, dinner in Italy. 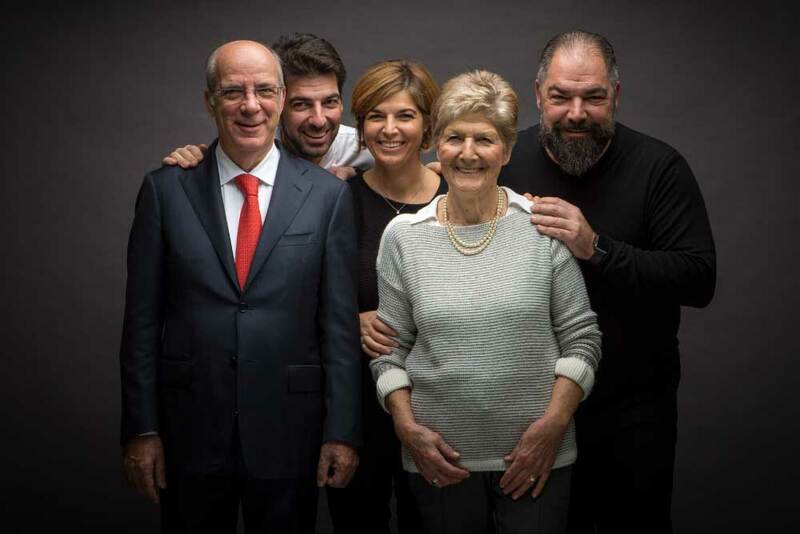 We’re off on an exciting adventure to find out more about this amazing family and how they achieved the reputation as not only one of the best restaurants in Italy, one of the best restaurants in the world. 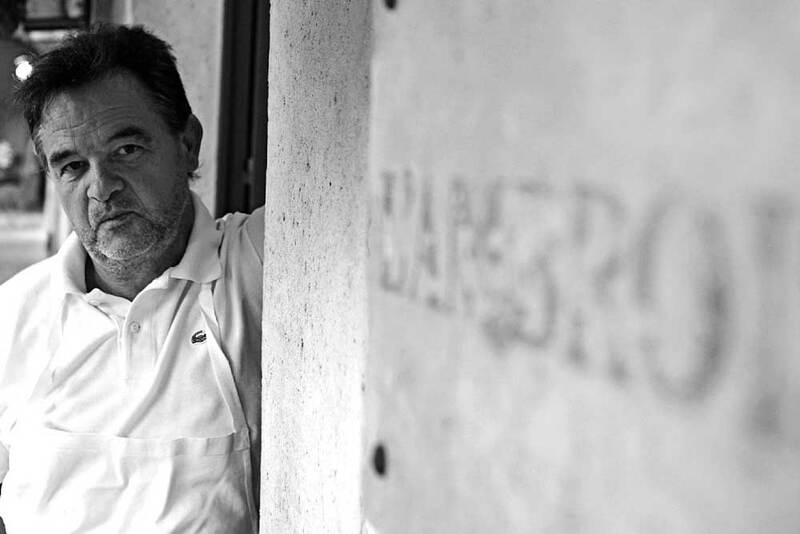 Le Calandre is a family run restaurant, located in Sarmeola di Rubàno, 40km west of Venice, Italy. 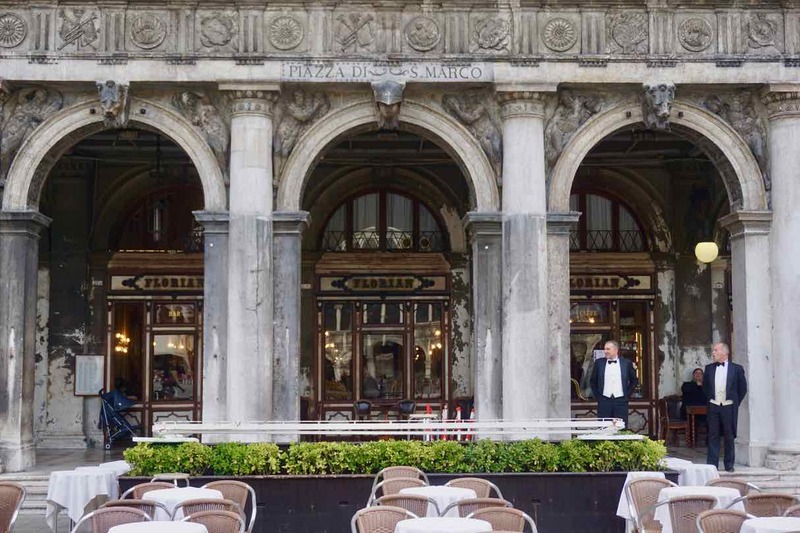 Opened by husband and wife Erminio Alajmo and Rita Chimetto in 1981. It continues today as a family affair with their sons Raf and Max and daughter Laura. 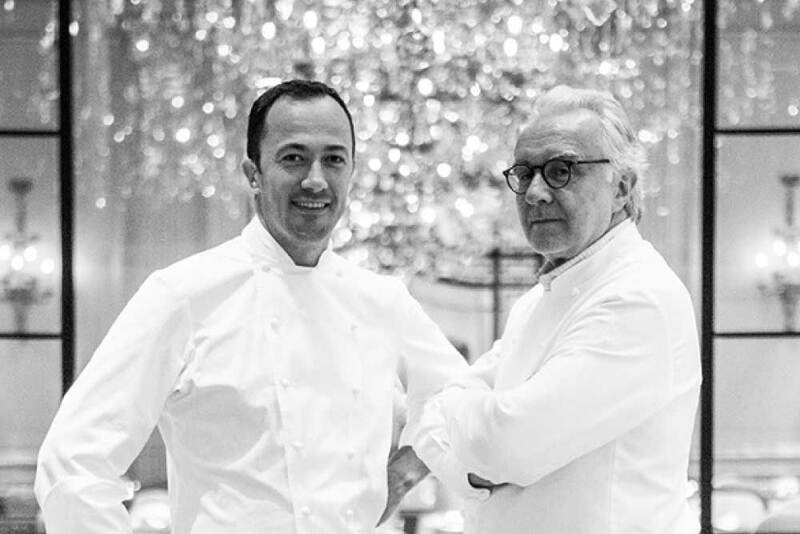 Le Calandre has maintained a place in the worlds50best restaurants list for over ten years. 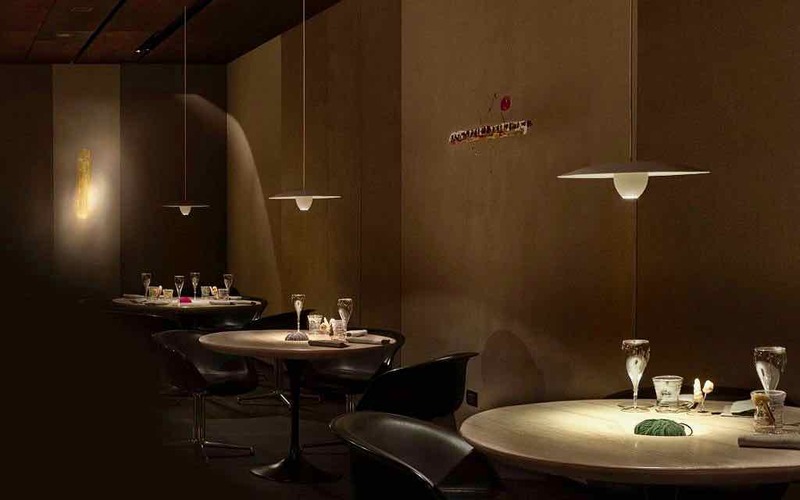 It has held Michelin Stars for over 25 years, maintaining Three Stars since 2003. All of this from very humble beginnings and very quiet Italian village of Rubàno. Rita as head chef, earned Le Calendre Restaurant’s first Michelin star while raising her young family in the kitchen alongside her. 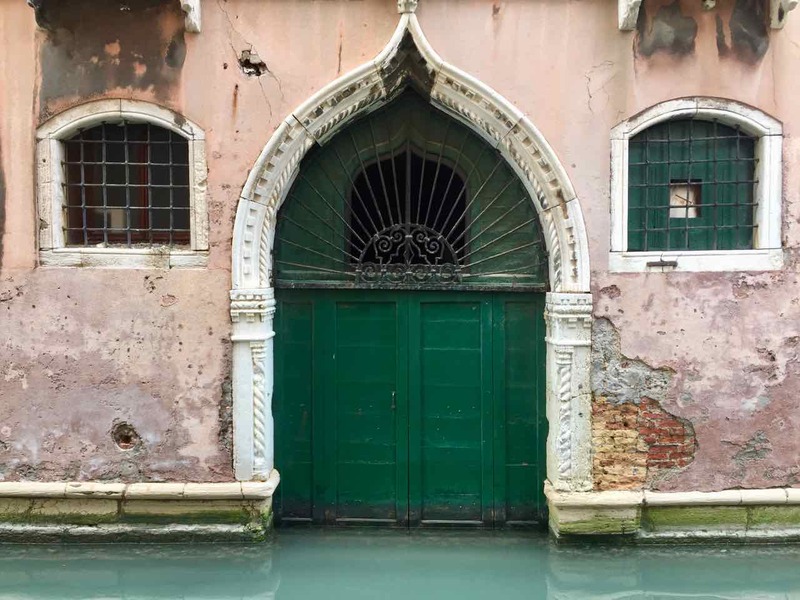 Young Max (Massimiliano) Alajmo started his apprenticeship as soon as he could hold a spoon. Max and big Brother Raf (Raffaele) have continued on their parent’s legacy. Raf managing the business, the front of house and expressing his passion for wine through curating Le Calandre Restaurant’s wine list and Max in the kitchen. 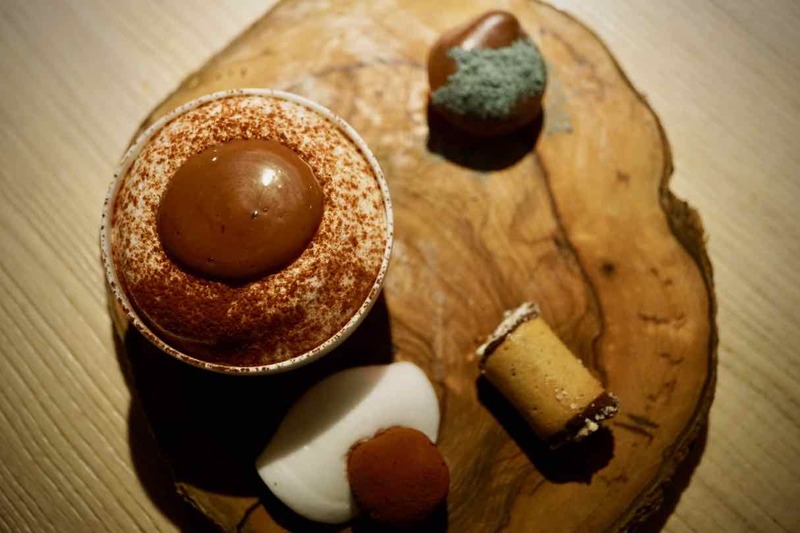 Max’s incredibly in-depth exploration of cuisine and ingredients took Le Calandre Restaurant’s kitchen to greater heights. 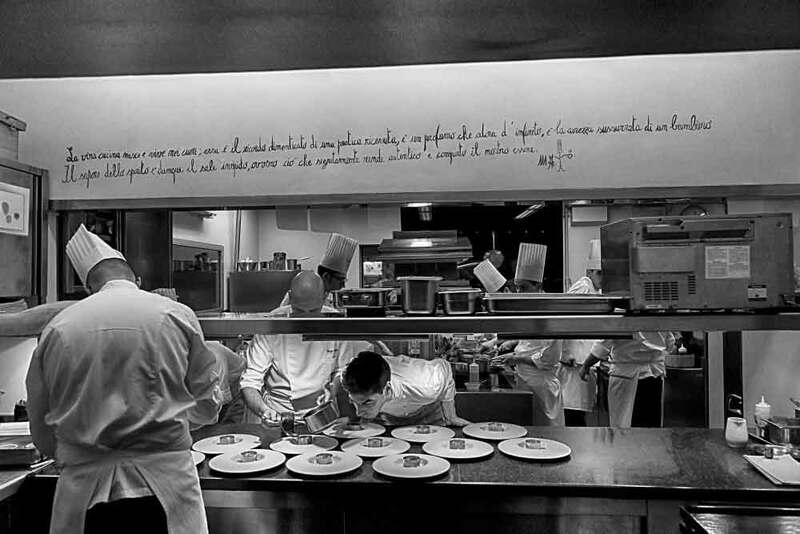 At only 28 he became the youngest chef ever to receive 3 Michelin Stars. The boys are now the powerhouse of Le Calandre Restaurant, but mamma Rita’s passion sees her still supervising the pastry lab to this day. 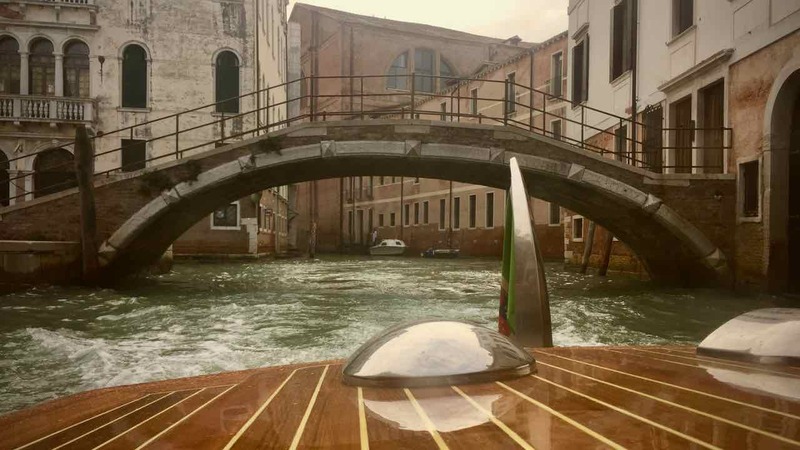 Our taxi picks us up from our little hotel in the historical centre of Padua, the town that Galileo called home for 18 years, which he later described as the happiest of his life. As we drive away from the old town and its spectacular medieval architecture into the Comune of Rubano the villages we pass through are quiet, more modern and nothing out of the ordinary. We pull up outside a very unassuming building amongst other ordinary looking shops and apartment blocks. We look around and I wonder just what does it take to create such success in such an ordinary place where no one goes. Inside elegance and style abound. The dining room a simple but exquisite room where earthy tones, soft moody lighting and hand carved timber tables create a welcoming warmth. We give each other a knowing glance, this will be superb, we can feel it. 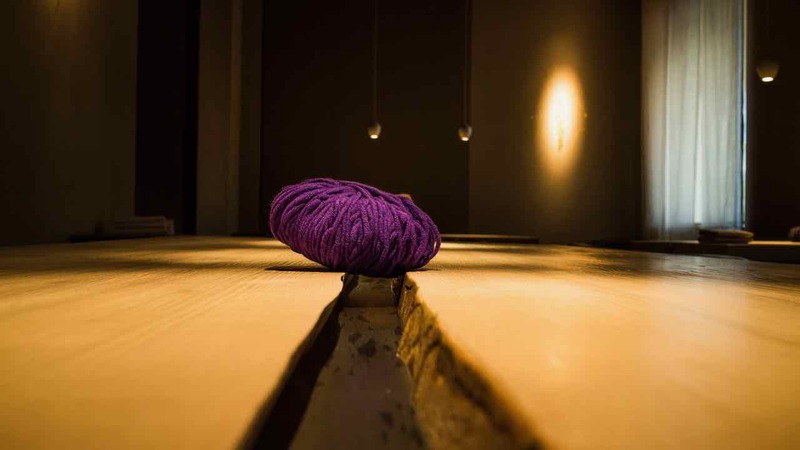 In the soft darkness there are only a few tables and each with a low hanging light that illuminates a ball of yarn sitting in a shallow dip carved in to the centre of the table. Our yarn is pink, I feel it is important, and I am fascinated to find out its significance. Lisa is our server tonight, she exudes warmth and a lively energy. She explains that the way the menu works is that guests have three different menus to select from; the Classico, the Max and the Raf. Within each of these menus there is an exciting selection of dishes. We chat with Lisa for a while and let her know we have come from Australia to discover the best expression of the kitchen. We are super excited when she offers to simply feed us and arrange the best selection from across all three menus. How exciting, all we have to do is relax and get ready for the surprises. I read these words and suddenly the ball of yarn in the centre of our table makes sense. Lisa quietly collects the yarn and pins it to the wall behind us. 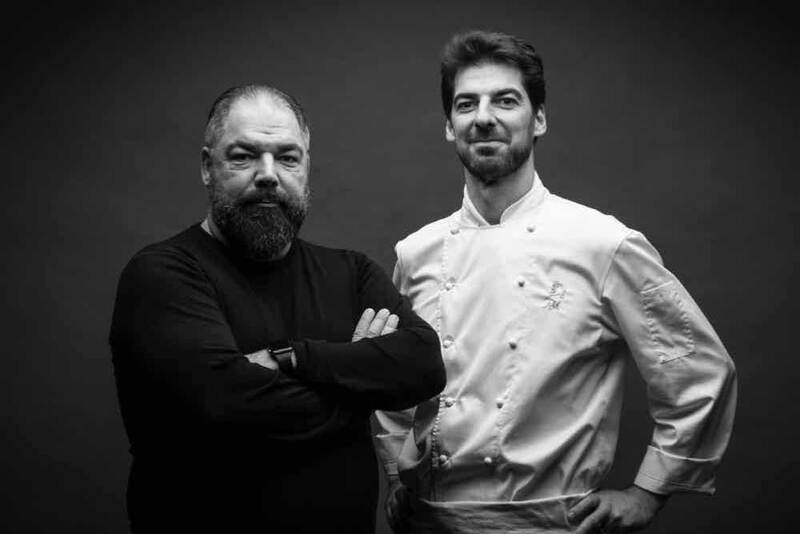 And before we have even tasted a bite, there is a knowingness that this guy is very deeply and passionately connected to his cuisine and he has already connected with me. And so the amusement of mouths begins with the amuse bouche and the first insights into the unique cuisine of Max Alajmo. Tuna Ice cream pillow, artichokes mustard seed, pumpkin ginger presented on a clear glass tube, with a thin thread of orange glass spun through it. The orange thread of glass appears to wrap through each morsel subtly continuing the idea of the thread of connection that cuisine weaves. Tuna ice cream pillow. Just one bite, this paper thin crispy pillowcase holds a refreshing, weirdly delicious tuna ice cream. Then a little tart with a creamy artichoke filling sprinkled with seeds including mustard seeds. For the last little crispy bite we have a cube of pumpkin, fragrant with ginger, soft in the centre and coated with a light tempura. Our first surprise dish comes from the Max menu. The fascinating combination of flavours is out of this world. Delicate pieces of Lobster Carpaccio with layered textures and flavours that are surprisingly complimentary. The avocado – bergamot cream brings a smoothness to every bite. Green apple and mushroom salad fascinating and a wonderful texture with faintly earthy notes. The bright fragrance of the green apple sauce is the final surprise that lifts everything on the plate to most exquisite heights. Our wine could not be a more elegantly matched glass. Gianmarco is our sommelier this evening, and he is an upbeat energetic young man who is clearly very motivated and excited to be working here at Le Calandre. Gianmarco has selected a lovely Riesling from Raf’s incredible wine list. A 2013 Peter Pliger Kuenhof Kaiton Suditrol. We are excited to try a great Italian wine, grown in the AIto Adige Valle, a region closer to the Austrian border. It’s fresh and flinty with enough age to have mellowed and smoothed its flavours, a bright and exciting wine to drink. The next dish, so striking, a monochromatic expression of Max’s colourful mind. 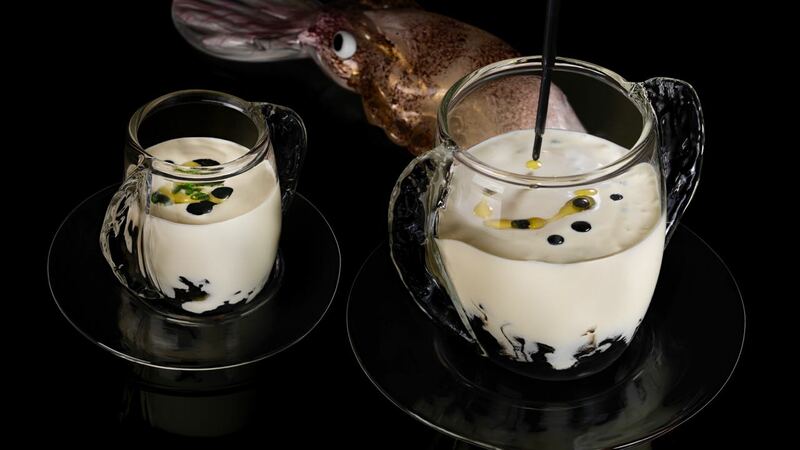 A glass, with handles shaped like cuttlefish wings, holds layers of black and white. 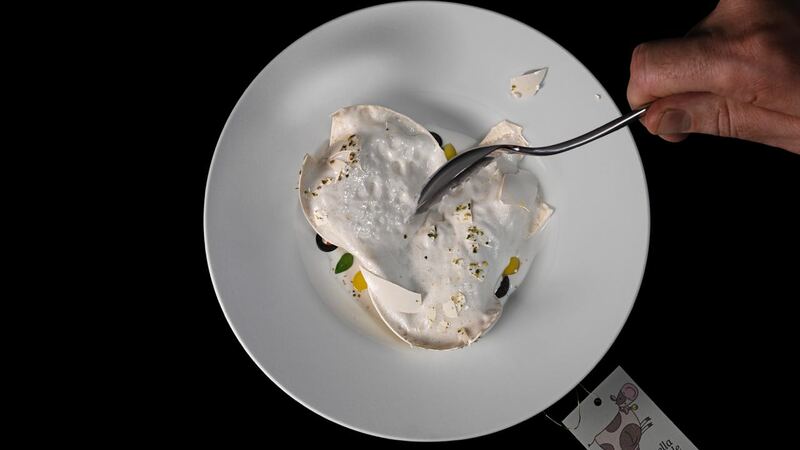 This dish is from the Classico menu and represents Max’s research into the concept of layering. This dish is about humble ingredients. The “cappuccino” is piping hot and Lisa tells us to dig right to the bottom, with every spoonful, like eating tiramisu. Potato, perfect potato, cuttlefish and cuttlefish ink. That’s it, simple. Yet through perfecting the cooking of each element and structuring them in separate layers, Max has actually left the alchemy up to the diner. It is that moment when the separate elements come together in my mouth when simplicity becomes magical complexity. With each spoonful of this dish I feel deep comfort and satisfaction. 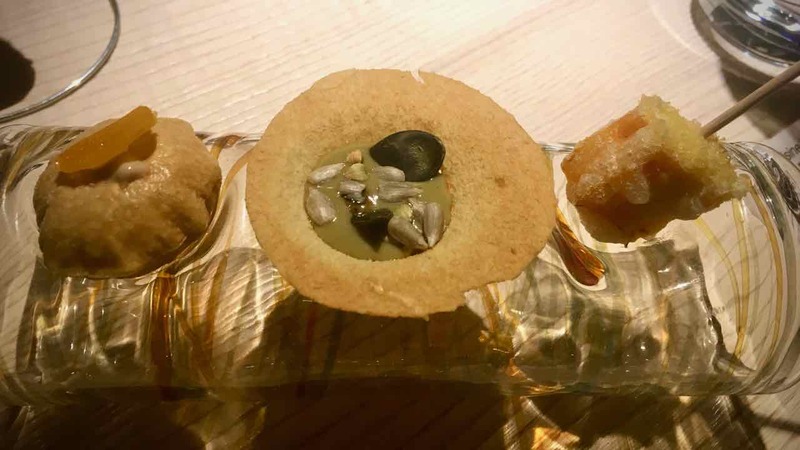 This dish is from the “Max” menu. A shallow white bowl glistening with a richly fragrant mushroom broth in the centre of which sits two perfect little pasta parcels. Cappellacci, a little pasta shaped to resemble a hat. Filled with an incredible, deeply flavoured squash filling, a warm golden hue and earthiness from the tumeric punching though. The broth, how can I even begin to describe the story that this mushroom broth tells. 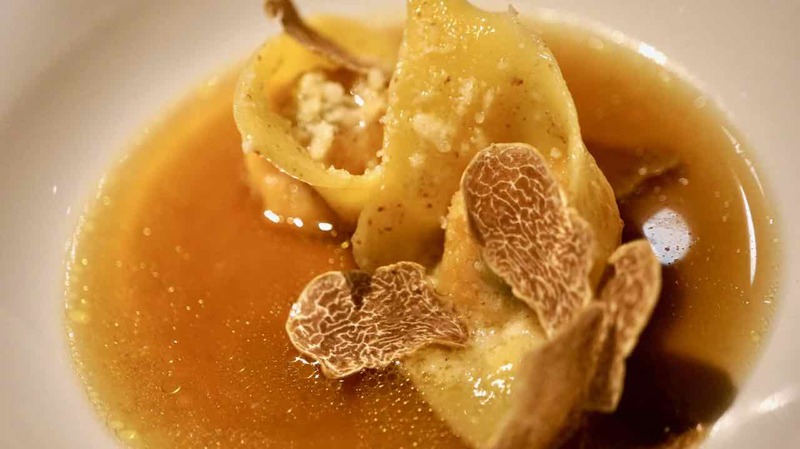 It envelops the pasta and its warmth, richness and character, pulls the entire dish together. Again I am inspired by simple ingredients infused with love, becoming inexplicably divine. Now I am a massive fan of rice and risotto has got to be one thing on my comfort food list. This one, from the Classico menu, is without a doubt, the best risotto I have ever eaten. 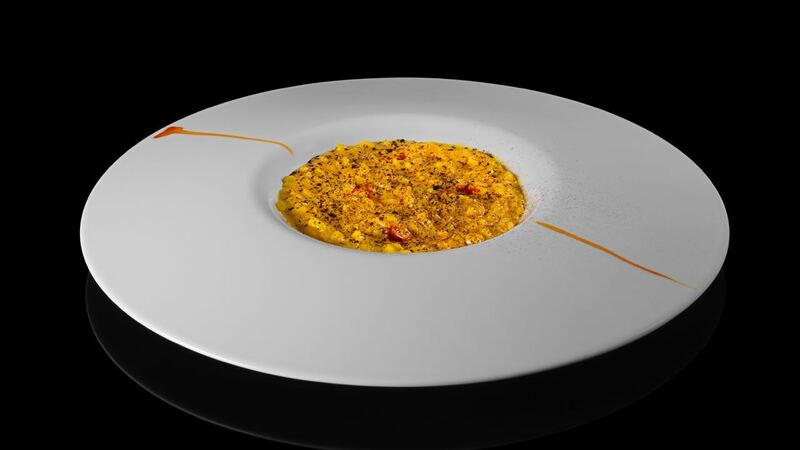 This risotto, born as part of chef Max Alajmo’s in depth research into “Powders”. Max dedicates this risotto to his wife, Mariapia. The rich yellow of the dish gorgeous against the simple white plate. A sprinkling of black liquorice powder creates a pretty contrast. It almost seems it is glowing deep gold, illuminated by the pendant light above the table. And the fragrance, a heady enticement to what is coming. The first bite of this risotto is an event. Without doubt this is the most exquisite risotto I have ever eaten. The texture of the grain is perfect, the balance between dryness and liquidity is perfect, the flavours are outstanding. I hereby announce that from this day forward my last meal request will be Massimiliano Alajmo’s licorice saffron risotto. Now a dish from Max’s research around tactility. 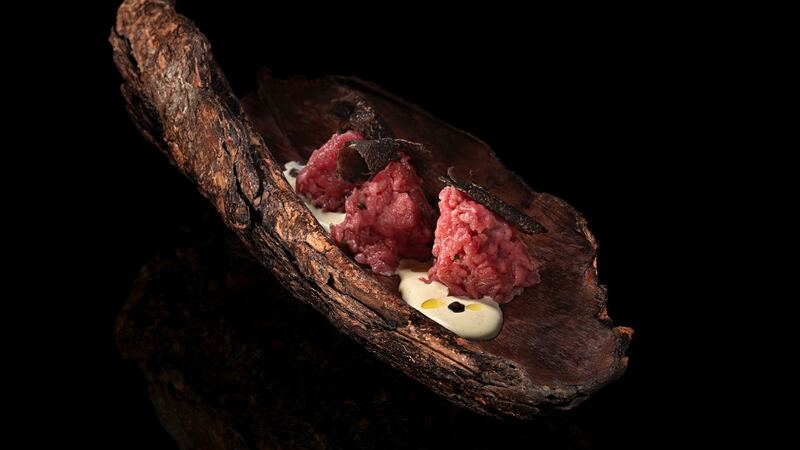 Beef served on a piece of bark. The lean beef has been hand chopped, so fine that the texture has become smooth. Piedmontese beef is a fascinating breed of cattle, pretty pale coloured cows that become greyer as they age. Born with a genetic structure that means their muscle to fat ratio is much higher, also known as “double muscling”. So quite the opposite of the marbled Wagyu beef, this meat is lean. The raw finely chopped meat is the perfect way to enjoy the flavour of this sweet clean meat. Truffle the ideal earthy accompaniment both as an addition to the chopped meat and also in the perfectly proportioned little streak of truffled egg mayonnaise, squeezed along the piece of bark on which small mounds of beef sit. The flavours are pure and speak of the earth. 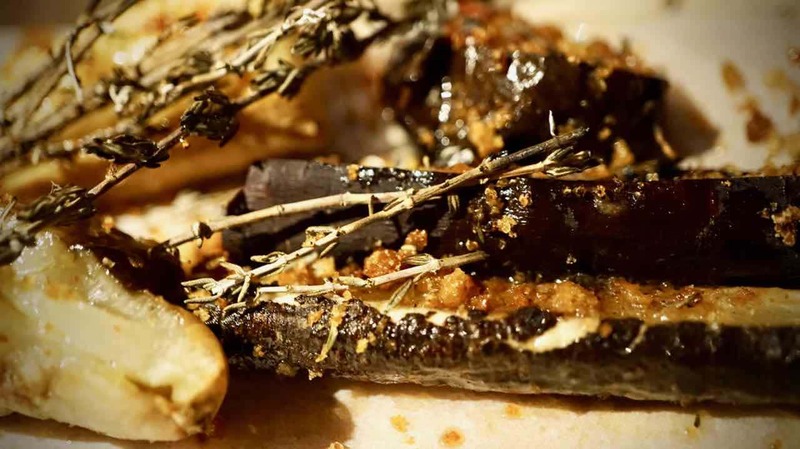 The texture of this dish is a real surprise. Delightfully smooth and velvety and as the cold raw beef warms in my mouth, the texture becomes more fluid. I close my eyes, mindfully enjoying the sensation of the meat melting and releasing its natural sweetness. Before we were served the amazing beef, Gianmarco introduced us to a gorgeous Chianti. Poggio Delle Rosa, Castelin Villa Chianti Classico 2009 Reserve. Deep dark brownish red, smooth round ‘chocolate notes and an earthiness not dissimilar to truffle. I’m not sure if I am imagining it, but I could swear there is a hint of licorice. It proved a most ideal pairing with the beef. As we wallowed in the gorgeousness of the beef and red wine, amazed at just how brilliant and creative Max is, Lisa arrived with another dish. She leant in close, placed the plate on the table and secretively whispered, “a present from the chef – scorched vegetables”. There was something fundamentally wholesome about this dish. The sweetness of fresh vegetables touched by fire, just to the point of submission. Two simple elements; plants -filled with all the energy of the earth and flame – the first and simplest cooking technique. Sprinkled with smoky thyme, a crispy crumb, anointed with a golden green fresh garlic infused olive oil, these vegetables are spectacular. Beef cheek is our next exciting treat. Braised until fall apart tender and richly flavoured. 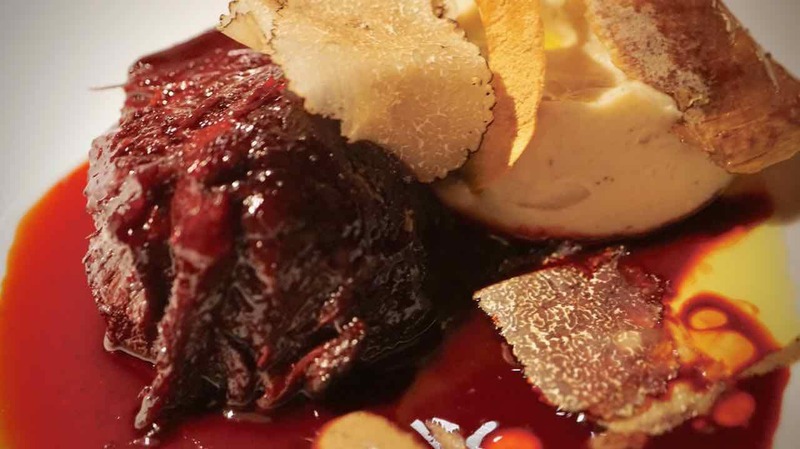 The meat rests on a silky smooth celeriac puree and the finishing touch is a deep purple, glossy beet jus. Sweet, earthy, rounded, smooth. Everything about this dish feels like comfort, like coming home. Another perfect match for our Chianti which is a joy with this dish. It’s time for the cheese course. We have been lucky enough to have enjoyed lots of gorgeous French cheese. So when dining in France we often pass on the cheese course, in the interests of saving room. But here we are in Italy so we can’t pass up the opportunity to try a few local curds. Lisa talks to us about all the stunning looking options on display and part of me is saying “ooh I want them all” so the safe option is to just let Lisa select a few choice treats for us. 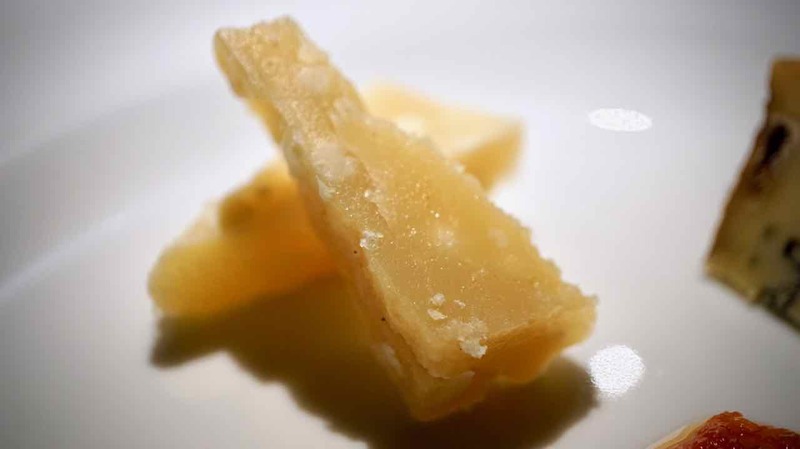 We taste wonderful samples of Calabrian blue cheese; a forty eight month aged parmigiana; a ninety month aged parmigiana. All these cheeses were superb and then the final cheese was such a fascinating finish, a two year old sheep’s cheese from Sardinia, unique and delicious. Then comes a ceremonial transition in the evening as Lisa removes our pretty pink yarn from the wall and places it back in the centre of the table. A poignant reminder of the singularity of the thread of joy, pleasure and love that Max has cleverly and passionately woven through our culinary journey tonight. As Lisa places our ball of yarn back in the centre of the table She puffs a discreet pfft of coffee essence into the air. Suddenly my focus moves to imaginings of sweet delights. The air is charged with anticipation. It feels like after the first coffee flavoured waft I have held my breath waiting for the next plate. A palate cleansing, very playful little collection of refreshing fruit sticks is a colourful and clever segue to the dessert section of our evening. 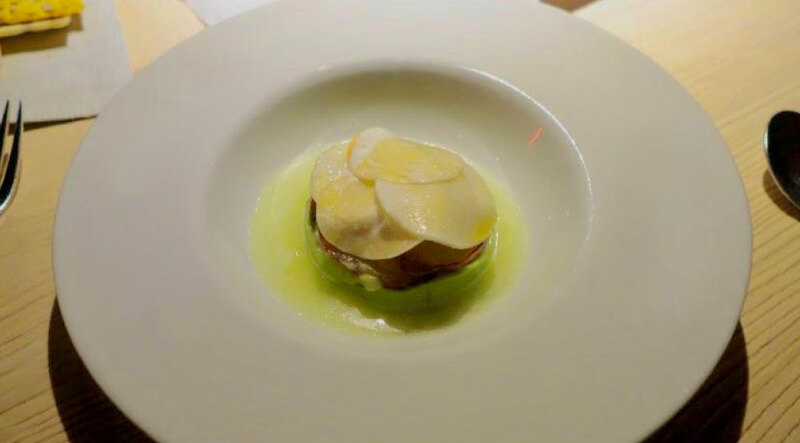 A white plate is set before us holding a perfectly smooth white ball that looks like a mozzarella ball. Sprinkled with what looks like black pepper and a tiny basil leaf. A light tap with the lack of my spoon cracks open the paper thin crispy shell of the ball revealing one of most fascinating desserts I have ever eaten. 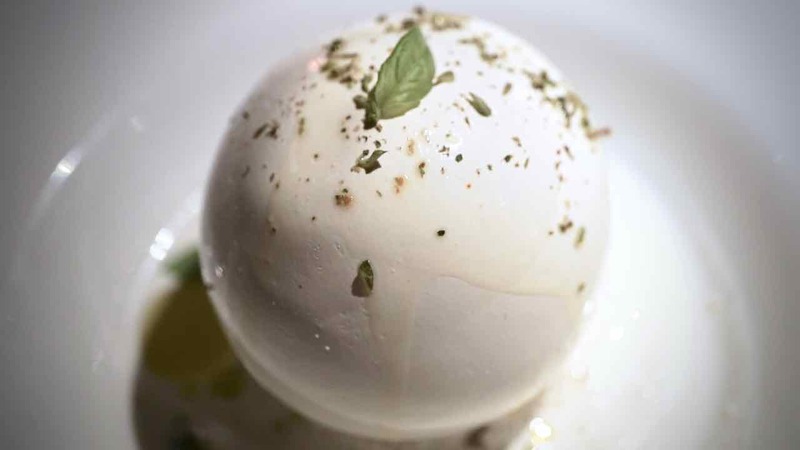 Mozzarella, light and foamy, olive oil, olives, Almond. Some of my favourite things but things I am used to being savoury. Max has flipped my senses upside down. I love it. Our final plate is almost beyond words. I can’t even call it a plate. Seventeen (to celebrate 2017) different tiny chocolate bites each decadent and unique. And yet the whole presentation, gives the sense of many voices, singing the same song in perfect harmony. As I close my notebook on this most incredible evening, I feel it is much more a beginning than an ending. This is the beginning of me seeing the world more clearly than I ever have before. Max Alajmo has told a story tonight, a story of love, a story of passion, a story of connection that has resonated strongly for me. Each dish has been a beautifully crafted stitch, in the magnificent tapestry he has woven. Each dish has brought surprise and delight. The whole experience has awakened a deep internal knowing, a sense of oh my goodness, of course. I know this, I know the power and the passion that cuisine brings to the human experience. This is it, this is why I love what we do. 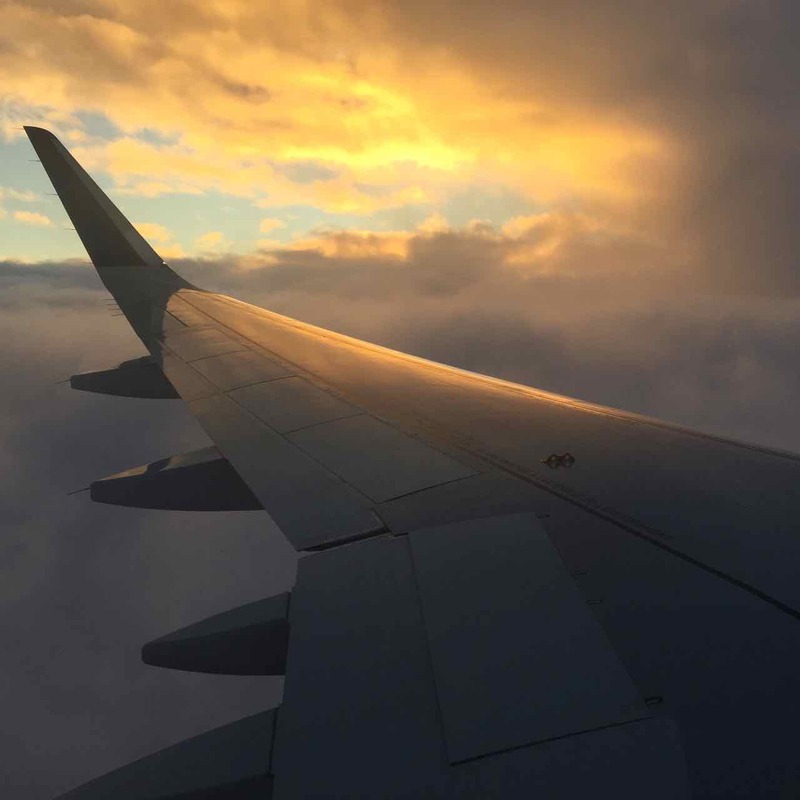 This is why whether I am sitting at my own family table or travelling to the other side of the world to sit at the Alajmo family table, I am home. I steal one last contemplative moment focused on that ball of yarn sitting in the middle of the table. Throughout our meal it has been quietly whispering to me, helping me to pay attention to the thread of connection that Max has woven, that now inextricably connects us. Max has found a tangible way to describe what has always been a deep feeling in me. 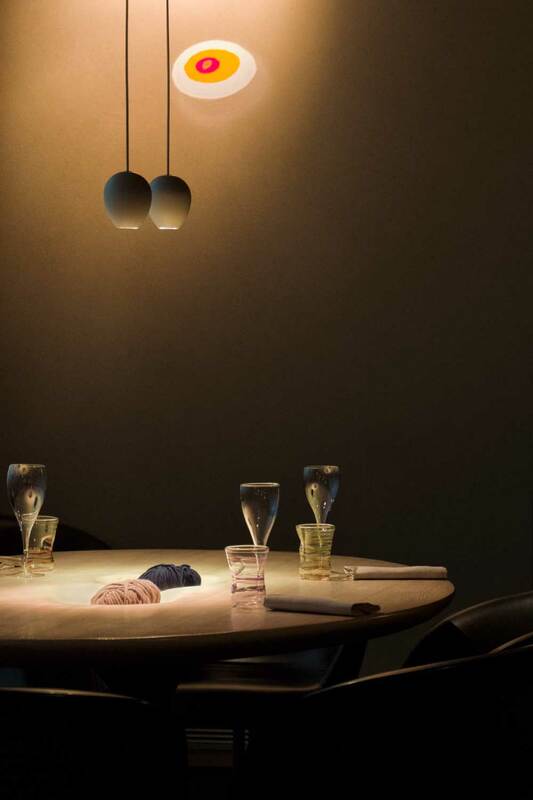 Whenever I try to explain what food, cooking the cherishing and savouring of life itself means to me, I will always remember the quiet darkness of this dining room and the soft pool of light that only illuminates a ball of yarn. Special thanks to Marisa Huff and Andrea Coppetta Calzavara for sharing images and menu’s in English. To the entire Le Calandre team, thank you so much for an unforgettable and wonderful night.